Summer is in the air, and the farmer’s markets here in San Francisco are overflowing with beautiful flowers! With that in mind, ABCey thought it might be fun to get crafty and make some decorative vases. Since mason jars are quite popular right now, we decided to take it up a notch and add a unique gold-dipped edge, all gold, and an ombre to the mix with our jars. They were so fun to make that we wanted to share the results with you! 1. First and foremost, put down lots of newspaper, preferably in a well ventilated space or outside — the spray paint gets messy. 2. 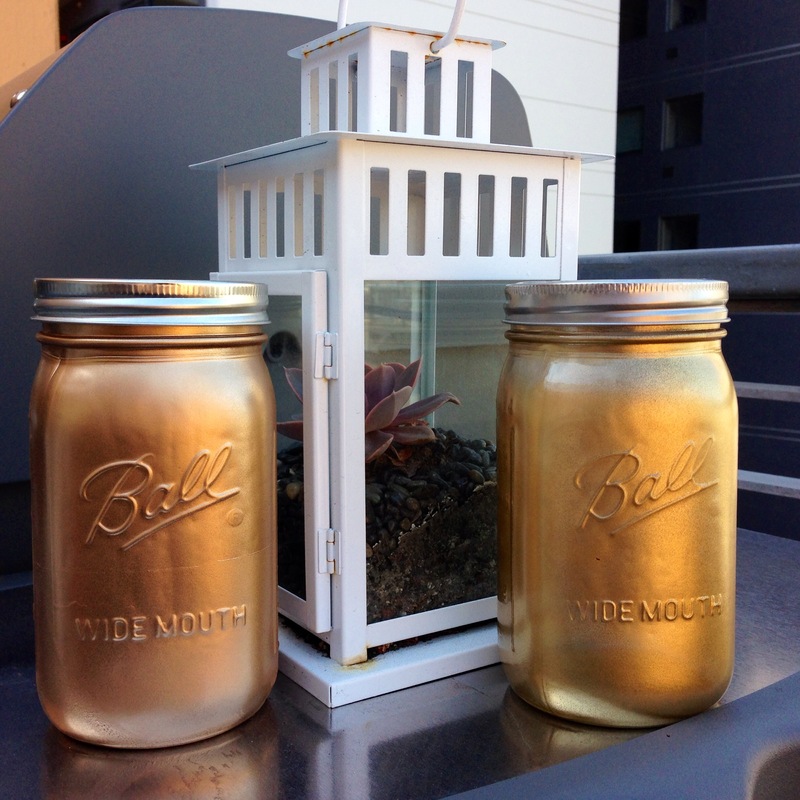 We started with all gold jars, which require an easy couple layers of spray paint, and you’re left with a simple, elegant, golden mason jar. 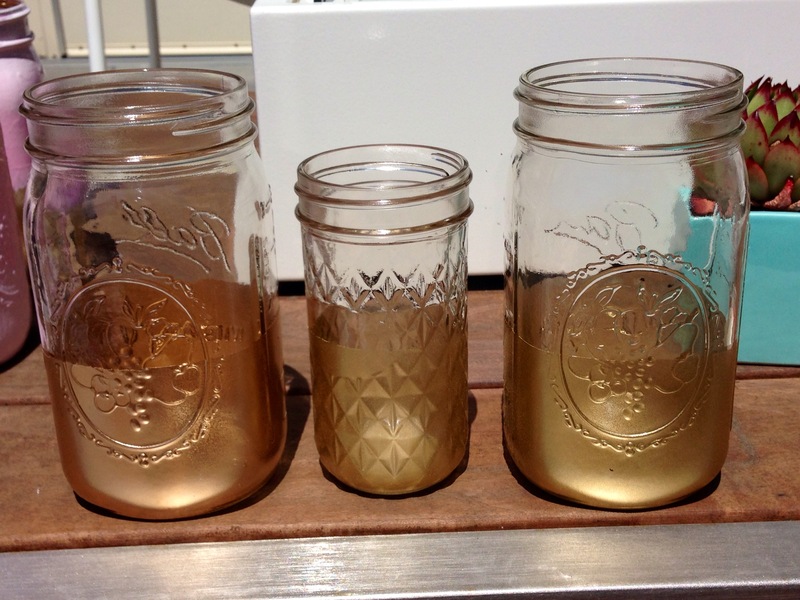 Stand at least 12″ away from the jar as you spray or it goes on too thick. A couple light coats is better than one thick coat. 3. To make only part of the jar colored, tear off a piece of masking tape and wrap it around the jar to mark the line where you want the color to end. 4. 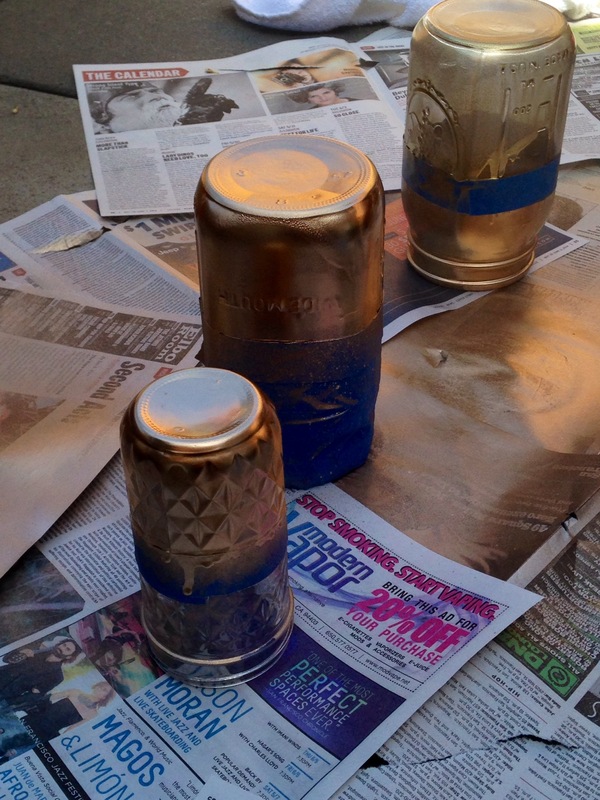 Turn your jar upside down on the newspaper and spray your jar with spray paint above the tape line. 5. Let it dry and apply another coat once it dries, but watch out for tricky drips if you apply a thick coat. After the paint is dry, simply remove the tape. It is likely that some paint will have leaked under the tape. Just used a sharp object to scrap it off. It should come off easily. 6. The next step is a little trickier. 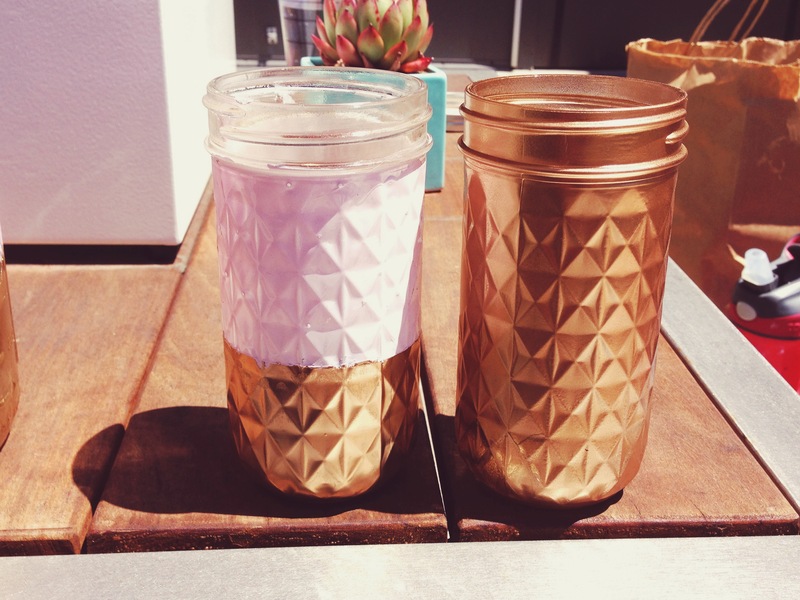 We loved these gold dipped jars so much that we decided to try some other styles so we painted some of our half gold jars pink on top! We wanted blush colored spray paint to do the other half but they didn’t sell blush colored spray paint, so we used paint and a paint brush. Make sure you use water based paint, it will come out more smoothy and make less of a mess. 7. We were able to do ombre with the paint and paint brush, an upside to not having that second color of spray paint! 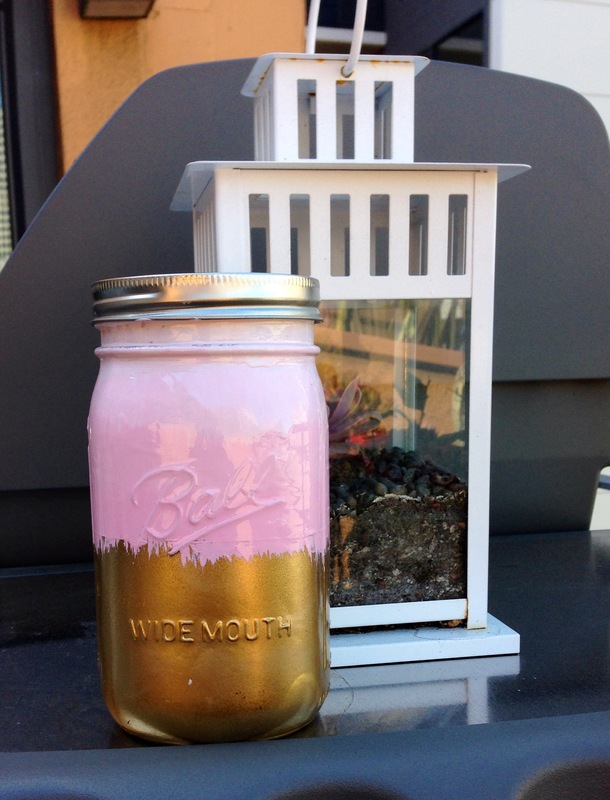 We took the pink color, applied it to an inch thick strip of the jar above the previously sprayed gold (make sure you do spray paint first, it dries faster and gives you a great guide for where to put the rest of your paint). 8. As you move up towards the mouth of the jar, make different batches of paint and add more white to each batch. We applied three batches and each was about an inch thick. The blending worked out really nicely because the paint dripped down after we were done. You can see that the blush pink gets lighter as you move upwards. All in all, we’re loving this look and this quick DIY. Hopefully we’ll be doing a couple more in the near future! How did yours turn out? What did you use your painted jars for? Share you thoughts with us on Facebook and Twitter or leave us a comment below!